Shaun is a Senior Research Fellow at the University of Glasgow, in the Institute of Biodiversity, Animal Health and Comparative Medicine. He is interested in the physiological and behavioural ecology of animals and especially how energetic demand influences trade-offs involved with foraging and predator-avoidance behaviour. During his PhD at Memorial University of Newfoundland in Canada (2007), he studied how metabolic traits interact with behaviour throughout early development in larval marine fishes. Most recently, he has focused on how environmental change affects relationships between behavioural and physiological traits in an ecological context. Killen has also examined the physiological effects of catch-and-release angling in fishes. Most recently, this line line of inquiry into physiology and mechanics of fish capture is being extended to the study of mechanisms underlying fisheries-induced evolution. Read more about this project here. Amélie’s research aims to understand phenotypic evolution at different time scales. She is interested in environmental (phenotypic plasticity), trans-generational (epigenetics) and genetic (evolution) effects in the adaptive response of fish to environmental disturbance. During her PhD at the University du Québec à Rimouski in Canada, she studied the evolutionary capacity (genetic and environmental components of phenotypes) of different populations. Most recently, she has studied human environmental disturbances, including how ocean acidification, hypoxia or pollutants may affect fish phenotypes across generations. Her current research – funded by a Marie Curie Fellowship – mainly focused on the fisheries-induced evolution, specifically, how fisheries selection or change in population density may impact the phenotype, evolutionary capacity, and the genome of fish populations across generations. Barbara’s research broadly encompasses fish and fisheries ecology, with a particular interest in behavioural and spatial ecology. During her PhD at the University of Perpignan she worked on the effect of habitat modification on fish and fish communities. She also examined structural and functional connectivity of fish populations, linking individual movement patterns with seascape properties and life-history strategies, and modeling larval dispersal to predict priority conservation areas. More recently, during her post-doc at the University of Gothenburg, she studied behavioural mechanisms and responses of fish to human-induced disturbances, such as predation by recreational fishing. In her current work as part of the PHYSFISH project, Barbara will continue this line of research investigating the linkages between individual variability of phenotypic traits, vulnerability to capture and post-release mortality (discards). Natalie's current research focuses on ecophysiology, phenotypic plasticity, and environmental change. More specifically, she is investigating the morphological, physiological, and behavioural mechanisms underlying adaptation to changing temperatures, using Icelandic three-spined sticklebacks from geothermal hot springs and adjacent lakes with cold water. This work is funded with a NERC Highlights Grant along with Kevin Parsons (PI), Neil Metcalfe, and Jan Lindstrom. Before coming to University of Glasgow, she studied reproductive behaviour and family interactions in burying beetles for her PhD at University of Edinburgh. For her Master's degree at Yale University, she studied phenotypic plasticity and sexual selection in green swordtails. In her spare time, she enjoys diving, hiking, and nature photography. Louise is a movement ecologist whose research focuses on the emergence of space use patterns from low-level behavioural processes. During her PhD at the University of Montpellier she studied the consequences of the use of memory by foraging individuals. She developed new tools to characterize and quantify recursive movement patterns, and developed an individual-based model to investigate how memory affects formation of animal home ranges. Her current research is funded by a Newton Fellowship and is being carried out in collaboration with Jason Matthiopoulos, Dan Haydon, Grant Hopcraft, Ewan Wakefield, Jan Lindstrom, and Shaun Killen. She is aiming to determine the degree to which space use patterns are affected by cognitive ability, movement constraints, social behaviour, and environmental conditions. She will use a combination of individual-based modelling and recent statistical advances applied on movement tracking data on three ungulates, two seabirds, and one fish species. Jack`s research interests lie in how physiological processes ultimately manifest in patterns of behaviour and movement, and how these processes effect the severity of anthropogenic impacts on marine species. He completed his MSci in 2013, and subsequently began work for an independent research company in South Africa. Here, he conducted field research on the spatial ecology, residency patterns and behaviour of shark species along the South African coast, using a combination of photo ID, acoustic telemetry, and mark-recapture techniques. This work extended to investigating impact of recreational fisheries interactions on small shark species, monitoring stress responses from the physiological to behavioural level using blood chemistry and accelerometry. His PhD thesis will investigate how physiology in wild fish influence patterns of habitat use and behaviour, and how these patterns influence susceptibility to capture in commercial fisheries. Davide is interested in the behavioural ecology of fish, particularly how anthropogenic impacts affect fish behaviour and population dynamics in a conservation context. He is also a keen fish taxonomist, specialising in the identification of egg and larvae from the North Atlantic. He did his Master’s degree in Environmental Management from Southampton University and then worked for a fisheries engineering consultancy undertaking a broad range of research including behavioural fish experiments, acoustic and radio telemetry tracking programmes, large scale fisheries surveys and fish habitat assessments. His PhD thesis will focus on how selectivity in commercial fisheries has the potential to impact physiological traits in fish populations. To achieve this he will undertake laboratory work on selection lines of zebrafish (Danio rerio) as a surrogate for wild fish, analysing potential changes in physiological characteristics across generations between lines of fish with differing vulnerabilities to simulated fishing practices. Lucy is primarily interested in population ecology and how this varies under different pressures. For Lucy’s PhD thesis, she is investigating leadership in collective behaviour, focusing on fish behaviour in a project co-supervised by Grant Hopcraft, Colin Torney and Dirk Husmeier. In the future, she aims to look at how this can be used to implement conservation methods leading to improving sustainable seafood practices. Lucy completed her MSc in Marine Biology at Bangor University, Wales where she worked with IMEDEA, Mallorca, exploring the effect of anthropogenically altered water masses on juvenile fish behaviour. Before moving to Glasgow, Lucy worked as a hatchery technician and has been involved in a project with Cefas, exploring population distribution of vulnerable elasmobranchs in the UK. During her undergraduate at Eastern Washington University (Spokane, WA, USA), Tiffany discovered a passion for fish that led to a degree in Biology with a focus on Wildlife Management. Initially, she planned on completing an MRes in Ecology and Environmental Biology (Evolution and Systematics) at the University of Glasgow and returning to the United States with a goal of working for the US Department of Fish and Wildlife. However, her first project in my MRes in Glasgow allowed her to explore her interest in behaviour in terms of maternal effects. As there was an opportunity to continue this research as a PhD student in 2015, she chose to remain in Glasgow and continue in this line of research. Her PhD will further investigate the effects of maternal care, particularly in mouth brooding African cichlids, on offspring development, behaviour and neuroanatomy. Magdalene completed her MSci in Marine & Freshwater Biology in 2018 from the University of Glasgow, and over the course of her career has worked on a number of research and consultancy projects, for both the European Union and the private sector. Her interests concentrate on the impacts that anthropogenic activities have on specific species, population and ecosystems, how these change over a period of time, as well as the subsequent influences these can have on the future generations. One of her recent projects examined the effects of pollution on the reproduction and liver of the male benthic Blackmouth catshark (Galeus melastomus) in the Eastern Mediterranean. Her PhD focuses on how catch and release angling affects the physiology and behaviour of the Atlantic salmon (Salmo salar), and the effects this has on fish offspring. Daphne is interested in physiological ecology and evolutionary biology in coral reef fish. She’s currently currying out her PhD research at CRIOBE (Centre de Recherches Insulaires et Observatoire de l'Environnement) and is co-supervised by Suzanne Mills, Ricardo Beldade, and Shaun Killen. She previously worked on numerical simulations of larval dispersal in Mediterranean invertebrates. During her Master's thesis she then focused on the parental and environmental effects on development of swimming performance in young anemonefish. Her PhD examines environmental and phenotypic determinants of larval dispersal, seeking to provide a mechanistic understanding of the dispersal process in marine fishes to allow for more accurate predictions of how fish populations will respond to climate change. She is concentrating on ecologically relevant larval traits, including larval swimming speed, aerobic capacity, and morphology, critical for the understanding of dispersal ability. Guy is interested in individual variation in boldness in free-living fish and how this is affected by abiotic factors such as depth and time of day. He completed his Bsc Hons in marine and freshwater biology at the University of Glasgow and during this time he led four student research expeditions to the Egyptian Red Sea. His endeavours in Egypt earned him a scholarship from the Open Ocean Science Centre to undertake a PhD at the University of Glasgow. Guy's PhD thesis is on fish behaviour in shallow and mesophotic coral ecosystems and sees him based in El Qusier, Egypt six months of the year. Guy is a BSAC Dive leader and PSAI sidemount qualified diver. His research will see him diving to depths of up to 50 m and deploying BRUVs to survey the 50-100 m range. Aside from his own research, Guy has been tasked with implementing and maintaining three citizens science projects to be rolled out in both El Quseir and Dahab. He is passionate about coral reef ecology, conservation and engaging the general public in scientific research. Guy is co-supervised by David Bailey and Shaun Killen. Andria is a junior fisheries scientist based in Jakarta at the Ministry of Marine Affairs and Fisheries (MMAF) Indonesia. He has been working with the ministry over a 9-year career on a wide range of topics in fisheries biology and management including population estimation, mesopelagic deep-sea fish species, fishing by-catch, ALDFG ghostfishing, and analytical tools for tackling illegal, unreported, and unregulated fishing. Before working for the ministry, he worked as a fish farming technician in trout aquaculture company in Bavaria Southern Germany. 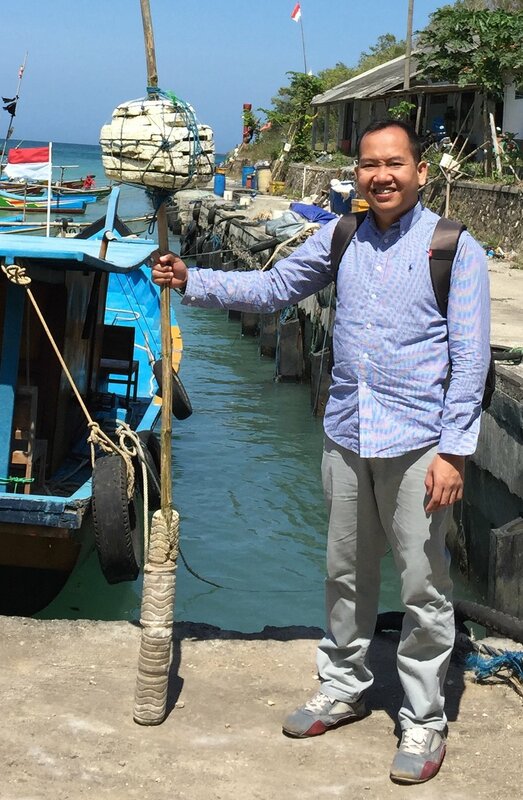 He earned a Master’s degree in Fisheries Biology and Management from the University of Bergen Norway, analyzing uncertainty in acoustic survey estimates of Bali sardinella in the Bali Strait, Indonesia. He is doing his PhD research at the university of Glasgow focus on study of spatial dynamics of tuna aggregations around Fish Aggregating Devices (FADs), social aspect of artisanal tuna fisheries, and artisanal tuna fishing vessels behavior. Hopefully, his work will provide a scientific basis of the policy to achieve sustainability of tuna fisheries in Indonesia as the largest tuna-producing country in the world. He is primarily supervised by David Bailey and co-supervised by Shaun Killen. Mar is interested in how environmental stressors impact fish physiology and behaviour. Mar completed her BSc in Zoology at the University of Manchester, where she studied the effects of multiple stressors on elasmobranchs. During her undergraduate, Mar completed a placement year in the Killen Lab where she looked at how increasing temperature affects the physiology and schooling behaviour of minnows. Mar is now back at the University of Glasgow completing an MRes in Ecology and Environmental Biology. For her masters project, she is investigating how the combined effects of hypoxia and increasing temperature affect the air-breathing behaviour of social catfish. In her spare time, Mar enjoys science communication and hiking. Isabel is interested in marine ecology and taxonomy and is currently completing an MRes in Ecology and Environmental biology. Her research project focuses on the effect of environment and metabolism on the social networks of air breathing catfish. She completed her BSc in Marine biology at the University of Liverpool, where she studied the cumulative effect of physical and chemical disturbance on benthic marine communities for her honours project. During her undergrad she volunteered at the World Museum Liverpool in the Zoology department assisting in the cataloging and identification of marine invertebrates. She has also worked in ecotourism as an on-board biologist for a whale and dolphin watching company in the Azores, Portugal. Libor interested in behavioral ecology, eco-physiology, and ecosystem functioning. He started his PhD working on life history, demographic, and genetic structure of brown trout populations in the mountainous headwaters of Šumava National Park in Czech Republic. However, love for salmonids and cold climate brought him in the last two years of his PhD to Scandinavia and the Salmonid Ecology Group at University of Gothenburg where he studied the effect of intra-specific differences in behavior and physiology on growth and survival of wild brown trout. More recently he worked as apost-doctoral researcher at the University of Paul Sabatier in Toulouse, France, where he was looking into various aspects of interactions between non-native species (salmonids and crayfish) and recipient ecosystem and native organisms. Jolle is a von Humboldt research fellow at the Max Planck Department of Collective Behaviour, Konstanz, Germany. He is interested in the fundamental role individual differences play in collective animal behaviour. In particular, his research focuses on how behavioural variation drives within- and between-group structure and dynamics and how in turn this determines consistent individual differences by its effects on group performance, using three-spined sticklebacks as his main model species. He works with the Killen lab via a Mentorship scheme from the University of Konstanz. Travis is interested in the effects of individual variation in metabolism on life-history patterns and adaptive trade-offs across species. During his MSc at the University of British Columbia in Canada (2010), he studied links among life history strategies, physiology and growth in juvenile salmon. During his PhD at the University of Glasgow in Scotland (2015) he studied the physiological, morphological, behavioural and developmental differences between offspring of brown trout from alternative life histories in an attempt to better understand the causes and consequences of partial migration. Travis is also a certified PADI Open Water Scuba Instructor. Travis continues to work with us on the PHYSFISH project but is now based at the Cape Eleuthera Institute, Bahamas. Julie is interested in ecophysiology and especially how environmental challenges affect animal physiology and behaviour. Her PhD work explored the physiological and behavioural differences that may allow invasive fish species to out-compete native species. Much of this work focused on comparisons between the stoneloach (which is native to Scotland) and the invasive bullhead. Through this work Julie gained broad experience in measuring fish metabolic rates, exercise physiology, and behavioural responses to thermal shifts and hypoxia. Before coming to Glasgow Julie completed a BSc Degree in Earth Sciences with specialisation in Marine Biology and Ecology at the University of the Mediterranean in France and an MSc Degree in Marine Environmental Protection at Bangor University in Wales. Julie is also extremely active in graduate student life and was a Graduate Student Convenor within the Institute. Along with some other graduate students she also co-founded and organised the popular Postdoc and PI Seminar Series. Lingqing is a university teacher and researcher, based in the College of Life Sciences at the Chongqing Normal University, China. He previously undertook a 12 month research fellowship at our lab in Glasgow. He is interested in the physiological and behavioral ecology of fishes and especially how stress affects variation in physiological traits and the ecological consequences. He is also interested in fish locomotion and metabolic demands when fish pass human-associated obstacles and during predator/prey interactions. He completed his Bachelor of Science at the Henan Normal University (2005), and his Master’s at the Chongqing Normal University (2008). During his PhD at Southwest University (2011), he focused on the responses of digestive tract and related organs to changing food availability in southern catfish. In his spare time, he enjoys playing badminton and soccer, and photography. Anita earned an MSc in Biology (2010) from Eotvos Lorand University in Hungary, specializing in Ecology-Evolutionary Biology and Systematics. She has always been interested in marine biology, conservation biology, aquatic ecology and especially fish behavioural ecology. She has previously worked in a public aquarium while also studying the parental and territorial behaviour of the Ocellaris clownfish. More recently she has worked as a zebrafish technician at the University of Burgundy and Vesalius Research Center, Belgium. She was also as a professional swimmer and sport diver for 8 years, and was Junior European champion in underwater orienteering.